The history of All Saints starts in 1853 when Jane Charlotte Smith returned to Jordanhill after living in Helensburgh. Jane was the daughter of James Smith who owned the Jordanhill Estate, and the Smith family had lived abroad for many years, but returned to Scotland from Madeira in 1848. Jane had been brought up a Presbyterian, but following the death of her sister Mary she had turned to the Episcopal Church. In 1853, aged 24, she started holding Sunday School classes in Jordanhill Mansion (the site of the present Crawford Building at Jordanhill College). She then moved these classes into a barn at the mansion and also held Sunday Services there. Encouraged by her success, she collected funds to build a Chapel School. Her father gave her a plot of land near Crow Road and on All Saints Day 1861 (1st November) her new building was opened with the service of Holy Communion at 8.00 am. This painting by local artist Robin Miller is based on an old black and white photograph in the church archives. 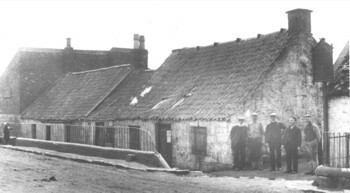 The original church building still stands today and is used as the church hall at the rear of All Saints. The photograph shows the interior of the 1861 Church School looking towards the altar which has now been reconstructed to form the platform at the east end of the present hall. 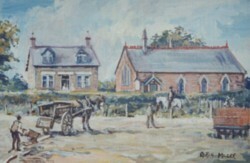 To the west of the church there was a parsonage, (see painting by local artist Robin Miller) subsequently referred to as The Rectory, which was extended on a number of occasions before being demolished in the early 1990’s to provide an access road for the new housing in Burlington Gate. The new Rectory beside the church was built as part of the land deal. Membership of the original Church School grew and by the end of the century the congregation began to consider the construction of new and bigger church. On 26 March 1904, the foundation stone was laid and on 1st November 1904 (All Saints Day) the new church was dedicated. 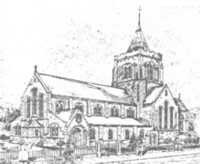 An extract from a local newspaper of 1904 which reported the stone laying ceremony is included at the end of this web page The organ was installed five years later and in 1910 the previously uncompleted North Aisle was opened. However the tower proposed by the architect was never built due to lack of finance. This extract from the Ordnance Survey map for 1913 shows the new church and the fully formed Woodend Drive. Jordanhill Church had also been built (it opened in June 1905) on the site of Woodend Cottage. Comparing the two maps it can be seen that Woodend Drive lies further south than the original track and the new All Saints Church is built on top of that track. Note also that housing had started to appear all around the two churches and from the start of the century, housing spread continually to what we see today. On 1st November 2004 All Saints celebrates its Centenary with a Choral Evensong. Further details on the History of All Saints can be found in a booklet published in 1938 by Margaret Macdonald which gives a lot of background information on the area. In 1954 the Rector at that time, Rev. Hopkins, compiled a booklet to mark the Jubilee of the Church. In 1991 the history was updated in a booklet covering the period from 1853 to 1991. A large gathering of the clergy and laity assembled on Saturday afternoon last on the occasion of the laying of the memorial stone of the new All Saints’ Episcopal Church, Jordanhill, by Mr Parker-Smith, jun. Among the clergymen present was Bishop Campbell. Among those present were Mr Parker Smith, jun., of Jordanhill; Mr D.D. Baird, factor; Mr James Chalmers, architect; Mr. Barlas, of Messrs Barlas and Co., contractors for mason work; Captain James Watson, contractor for woodwork; Mrs Provost Kennedy; Mr Maxwell, electrical engineer, Partick; and a large gathering of ladies and gentlemen. The upper platform where the memorial stone was to be laid was reserved for the clergy and the officials in the ceremony, all else being rigidly excluded, while the western portion of the lower platform was reserved for the choir, clad in white surplices, and assisted by four or five ladies. The proceedings began with a procession, led by choristers singing the hymn, “The Church’s One Foundation,” who marched to their appointed places. while the ecclesiastics, followed by the Bishop, and one bearing the crozier, ascended to the higher platform. After the appointed ritual and the singing or chanting of Psalms 84 and 127 with prayers intervening, the Bishop standing by, the stone was lowered into its place. Mr Parker Smith said: “In the name of Jesus Christ we lay this memorial stone of the Church of All Saints’, in the name of the Father and of the Son and of the Holy Ghost. May true faith here flourish, and the fear of God and brotherly love abound. Here may prayer be ever offered, and the Holy Name of Jesus Christ be praised” . The Bishop then prayed for the safety of the workers, for the benefactors of the church, and for the priest and people of All Saints’ Church. The hymn, “We love the place of God,” was sung, while the offerings were taken by those appointed. The Bishop then pronounced a blessing. and the choir began the hymn, “Onward, Christian Soldiers,” and marched away in procession singing this, followed by the clergymen. After the procession the ceremony was concluded. 1853 Jane Smith started the Sunday School and episcopal services at Jordanhill Mansion. parsonage when the first resident curate moved in. 1898 Mission Church extened to the size of the present Church Hall. J.F K Bamford became curate. 1910 Uncompleted North Aisle built. 1912 Electric light installed in the hall. 1919 Reredos put in to commemorate those lost in the War. glass was of poor quality so the colours have now faded. killed in the War. They also put in the stained glass window in the Lady Chapel. 1955 The kitchens and small hall added. Family history researchers may be interested to know that I have a photocopy of the Register of Baptisms for All Saints from 1854 to 1915 compiled by Rev Ian Meredith of Lockerbie as a research project. It is understood that the original documents have been lodged in the Mitchell Library for safe keeping. For the record I also have a photocopy of the Baptismal Roll for Jordanhill Chirch (and it’s earlier congregation called West Hillhead) from 1874 to mid 1966.